Ahead of tomorrow’s forthcoming model announcements from Bachmann, Hornby have timed a new announcement that they will be crossing off another model from southern 00 scale modellers wishlists in 2016 – the original Merchant Navy class. 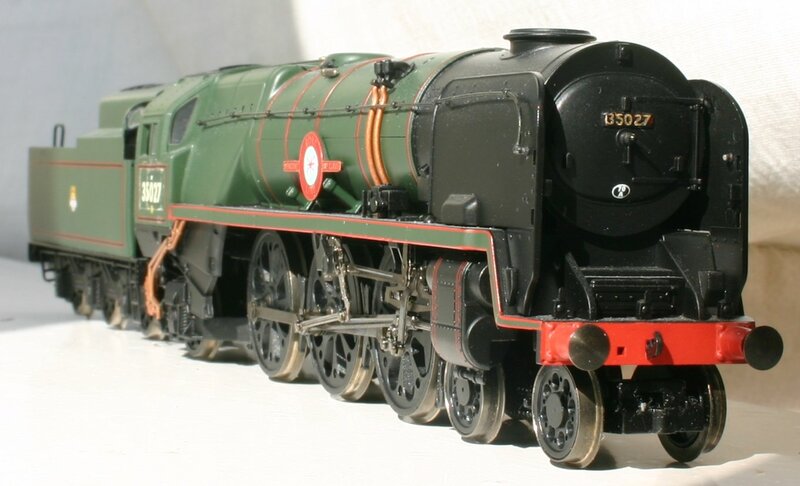 The rebuilt Merchant Navy class model (below) was the first 00 scale model to mark a new era of higher standards for Hornby. Since then both original and unrebuilt light Pacific’s have been produced, leaving this as the final configuration not catered for. Between Hornby and Bachmann all other models of all 8P rated types of locomotives have been produced in the country’s most popular scale, including the solitary 71000 Duke of Gloucester. As the rebuilt version of the Merchant Navy was the first 8P type to be produced as a super-detail model, it is quite fitting that the original locomotive has been the last. There was some speculation that Bachmann would also announce that they too would produce a 00 scale unrebuilt Merchant Navy class. The speculation has since been proven to be unfounded. There are many detail differences between different batches of the class due to Bulleid making revisions to the design. Hornby have announced that they will be producing models of the first batch of ten Merchant Navy class locomotives (including 21c1 Channel Packet,) potentially leaving the door open for a competitor to produce a different batch. Click here to read the full announcement from Hornby. To read more about forthcoming 00 scale steam locomotive model releases, please click here.